Hope you've all had a good weekend. We've been pretty lucky that the sun's still making a bright appearance over our weekends. Even so, don't be fooled my friends - autumn and winter are well on their way [already?! I know, I know]. This means my skincare routine has started going up a notch again to prepare for those chilly breezes. 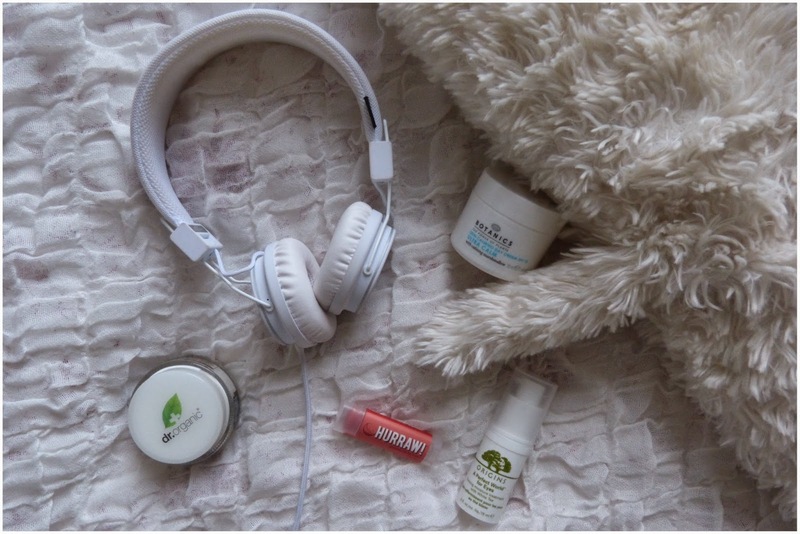 A bit of an all-white products scenario [not planned I promise] so I thought I'd throw in my recent bargain Urbanears headphones which I found at Tesco for £8.50 - that's right, they have infiltrated my skincare regime because they were that good of a bargain [thanks Tesco]. And yes, that is a fluffy white tail in there too - your eyes have not deceived you. Anyway, it's been a while since I've done one of these, a little different to my usual posts but hopefully 1] you find it interesting / maybe helpful and 2] I can get some tips from some of you on what you do to combat the cold and protect your skin. Let me know either way and thanks for stopping by! If you're interested in my other survival kits, check out my summer one from last year. 1 || eye cream - that's right people, I have started to use the old eye cream because let's be honest I have been doing a lot of smizing [thank you Tyra Banks] in my twenties and this shall continue. Seriously though, I woke up a few weeks ago and my eyes were feeling a little puffy and unloved so off I went to find an eye-sidekick. All based on recommendations, I first looked at Clinique All About Eyes which was a great little product, very light, absorbed quickly and had a smooth consistency. Then I checked out the much-talked-about Bobby Brown Hydrating Eye Cream which was the most expensive of the three, felt a little more luxurious and richer in texture in my opinion but again smooth texture. Finally [and predictably], I ended up with Origins A Perfect World for Eyes which is more of a serum, felt the lightest as a result and just smells amazing. Having used it for a few weeks now, I fully recommend. 2 || day cream - I've said it before but I think moisturising your face is so important. A good day cream should be number one on any skincare list and if you can only use one thing, I would say day day day all the way. Daytime is when your face is on its highest combat mode so you should give it a little helping hand. Previously, I've been quite loyal to Origins A Perfect World SPF 25 and if I could buy it every time I would. This time I ended up prioritising my budget with the eye cream so instead have been using Boots Botanics Skin Calming Day Cream SPF 15 which does such an excellent job that I haven't missed my Origins. The marshmallow makes the cream really soft, supple and light plus at 1/5 of the price of Origins A Perfect World, it's a winner. 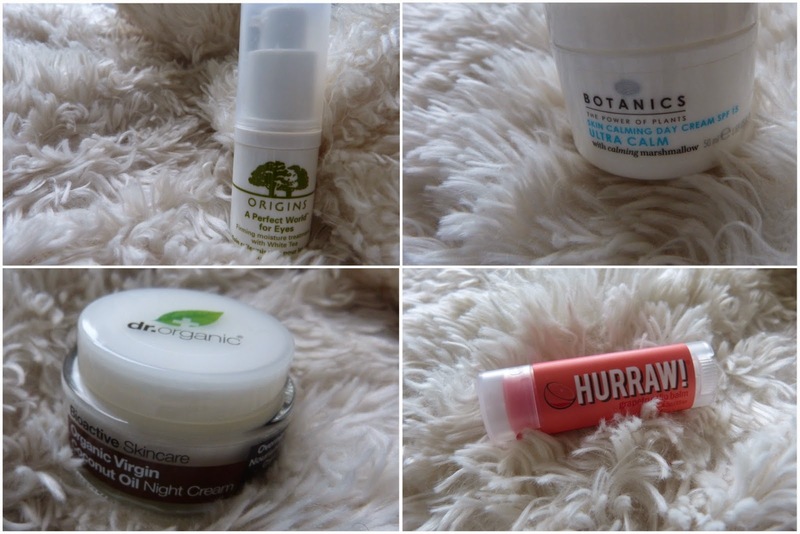 The whole of the Botanics range at Boots [based on what I've tried] seems to be a great all-rounder at a reasonable price point - and there are even products for boys [incase you're also reading this!]. 3 || night cream - "the experts" say your skin does most of its repair work while you're asleep. If that's the case, why not give it a little boost so that every time you wake up you can feel like a fresh new you. This is priority three on my skincare list so the amount I spend on it is usually relatively low. I've used The Body Shop Aloe Soothing Night Cream before and although I like it a lot I wanted to mix it up a bit. Recently, I've been using Dr. Organic Virgin Coconut Oil Night Cream which is packed with so many good oils. This means it does feel a little oily but I reckon my pillow absorbs quite a lot of it because by the morning my skin just feels soft and supple. The coconut oil makes it smell so good too. 4 || lip balm - probably the best impulse purchase I have made this year: Hurraw lip balm in Grapefruit. I was in Wholefoods buying some tea for mummy and BOOM right there at the check-out I saw this [so many colours, it was like a rainbow]. Yep, they got me good. I then got out of the queue to browse the many flavours and opted for grapefruit because it smelt amazing. The balm itself is easy to apply, very soft and moisturising. I want to buy the whole range, aaargh. There's even one called Moon Balm which is for night-time care and the name makes me so happy. Go try them!